It is one of the oldest type positive displacement flow meters. The oscillating piston meter is similar to nutating disc meter, except that the measurement devices Is a split ring/ piston which oscillated in one plane only. It consists a precision machined chamber (slotted cylinder that separate inlet and outlet part), a cylindrical piston. The movement of central piston constrained to run in a circular groove; it has an eccentric motion about center chamber axis. 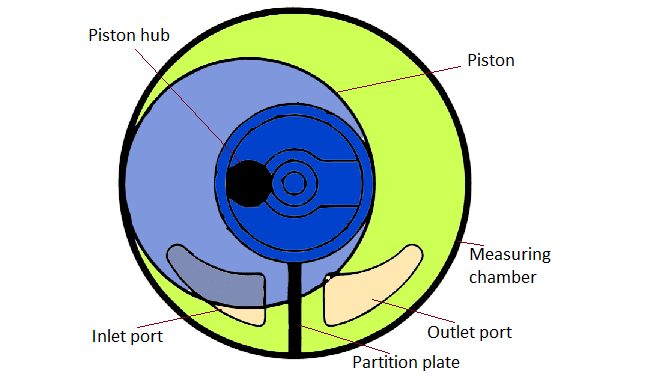 Center piston rotate as the liquid subsequently enters and exit from the chamber. Normally hydraulically floating piston do not come into contact with chamber. The housing normally made of brass or bronze, in some case plastic also used. A strainer of suitable mesh size is provided at the inlet, which avoids the entering of suspended solid particle into the chamber. The liquid enters and exit through the opening on flow meter chamber, underside to the piston. The pressure of fluid rotates the center hub. This rotation transmitted to register either by mechanically or magnetically through the diaphragm. Each revolution of piston indicates the corresponding movement of fixed amount of liquid. Oscillating piston meter suited for viscous fluid (paint, resin, ink). They are used oil metering where turn down is not critical. They can be used in the automatic liquid batching system. They are ideal for food and beverage application (honey, chocolate). Replacement of internal parts can be done without disconnecting meter from the pipeline. Eliminate straight pipeline in upstream and downstream. It can be connected to mechanical as well as electronic registers.